This guide covers integrating our File Uploader; it enables your PHP app to receive files and caches uploads on our CDN. It should take you about 20 minutes to build the working integration. By the second step of this guide, you’ll have the file uploading widget installed, and by the end, you’ll have a working PHP app. Note, we won’t be using any PHP framework in this guide. Most of the modern frameworks implement Composer, and the installation process should not be too different. If you are experiencing problems with your framework, shoot us a note in the community area. Let’s begin with checking whether all PHP modules are in place and installing libraries. If you haven’t found json or curl in the list, just google something like “install php-curl Your OS”. The installation may vary depending on your OS. If you’re planning to upload non-image content, add billing info to your account settings. We will use the PHP package manager, Composer. If you don’t have it (the composer command isn’t available), you can install Composer for the current project. Just copy and execute the commands from the Composer page via your CLI. Then, include the libraries in your project. We’ll cover the simple case where your project consists of a single index.php file. In real projects with complicated file structure, do the next steps in a place where you want the uploader. require_once 'vendor/autoload.php'; is requiring all Composer libraries that should load automatically, including the Uploadcare ones. 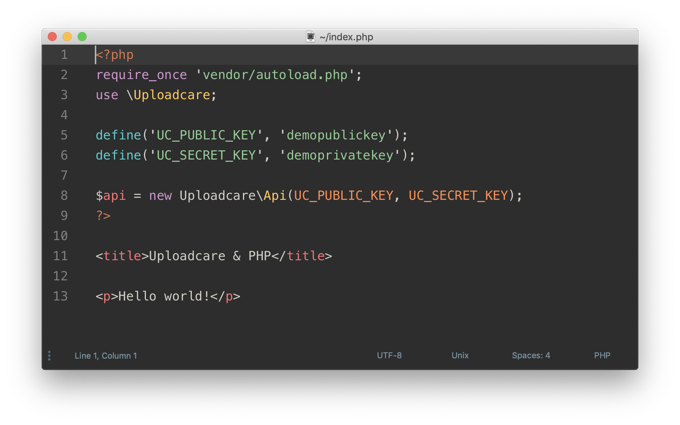 use \Uploadcare; allows current PHP script to use the \Uploadcare namespace. It isn’t necessary, but it can make your life easier. The last two lines in the above snippet define Uploadcare API Keys as constants. Don’t forget to replace YOUR_PUBLIC_KEY and YOUR_PRIVATE_KEY with your actual Public API Key and Secret API Key. you discovered at the beginning of this article. The widget creates a hidden input <input type=hidden> named qs-file. Its value will be then set to file’s identifier - file_id and transferred in a POST request. To ensure that the uploaded file won’t disappear after 24 hours, we are using the $file->store(); method. 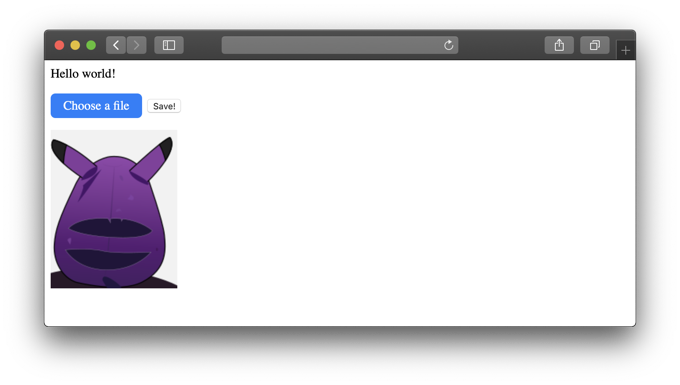 Yoo-hoo we’re done with the simple file uploading app!